Ensuring children are able to get the best from school is vital; not enough children are starting school with the range of skills they need to succeed – two in every five children in the capital are not ready for school aged five. Educational attainment is one of the main markers for wellbeing through the life course and so it is important that no child is left behind at the beginning of their school life. 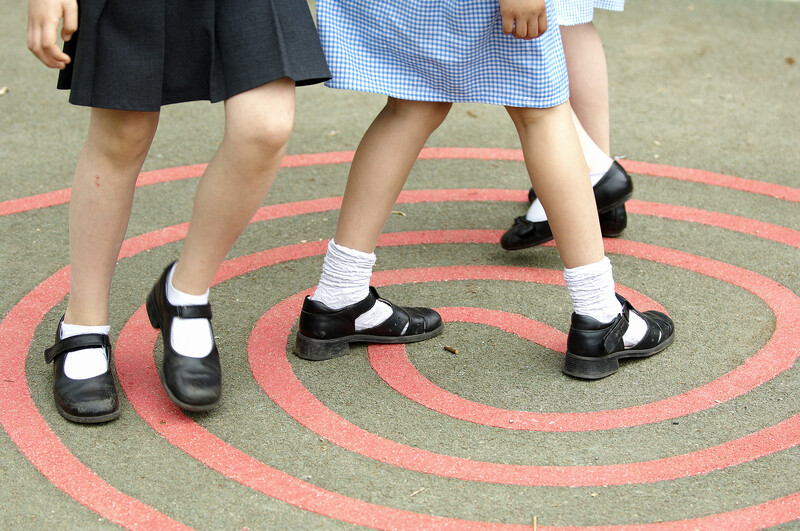 Public Health England (PHE) has made ensuring every child has the best start in life by being ‘ready to learn at two and ready for school at five’ one of the organisations seven national priorities; published last year. PHE London has published a report, Improving school readiness. Creating a better start for London, aimed at healthcare professionals, parents and carers, looking at the importance of school readiness, describing the situation in London, and showing how we can work together to make improvements and give all children the best start at school. School readiness is a strong indicator of how prepared a child is to succeed in school cognitively, socially and emotionally. 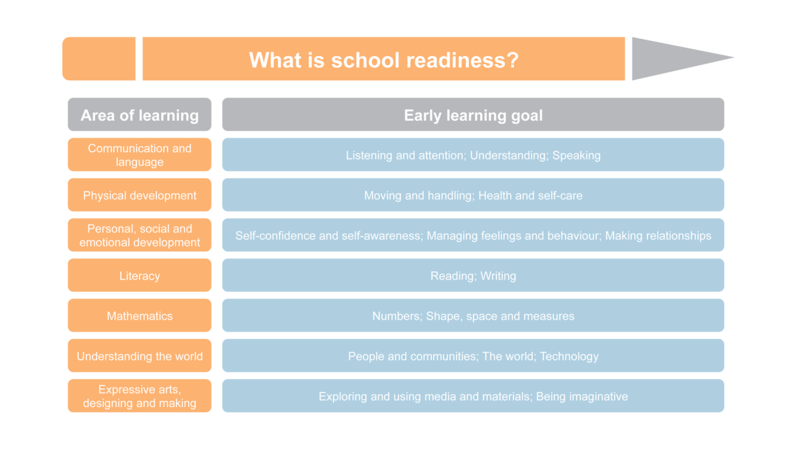 To assess how ‘school ready’ a child is, we use a measure called the good level of development (GLD). A child with a GLD at the Early Years Foundation Stage (from birth to five years old) will have reached the expected level in all the prime areas of learning. Evidence shows that those who do not reach a GLD by age five, will go on to struggle with key skills such as communication, language, literacy and mathematics. 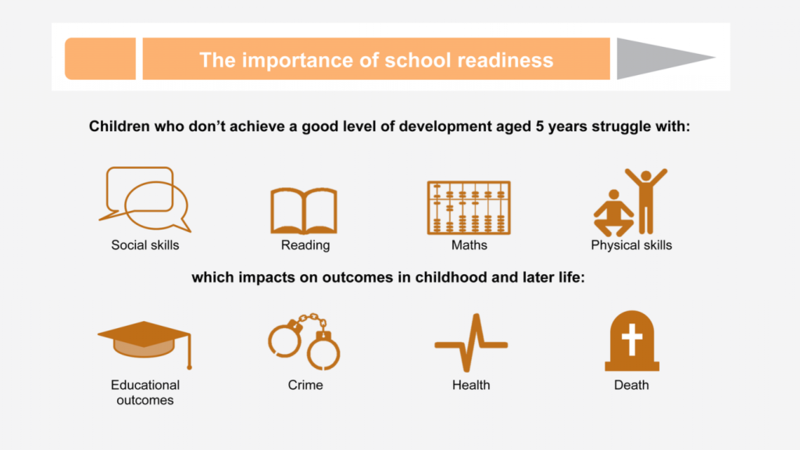 Levels of school readiness links to educational attainment, which impacts on life chances; it has been shown to impact on health, future earnings, involvement in crime, and even death. Early support from parents and carers enables young children to acquire the social and emotional skills, knowledge and attitudes necessary for school and later life. Parents engaging in learning activities such as speaking to their baby and reading with their child are shown to have a great impact on levels of communication. A child’s communication environment is a more dominant predictor of early language than their social background; so this really is an important part of successful early development. Some parents may not be aware, but physical activity is an important component of early brain development and learning. Communication skills depend on well-developed physical skills, such as effective movement and eye contact; however only one in every 10 children aged two to four meet the Chief Medical Officers guidelines of being physically active for at least three hours, throughout the day. PHE strives to support the provision of parenting programmes across London, to ensure parents and carers are educated, and have the knowledge and ability to give young children the early support they require, which will go on to benefit them throughout the course of their life. Parenting support combined with high quality early education, will contribute to a child’s early learning and ability, and put them on the road to being school ready. Investing in quality early care and education has also been shown to have a greater return on investment than many other economic development options. For every £1 invested in quality early care and education, taxpayers save up to £13 in future costs; in addition for every £1 spent on early years education, £7 would need to be spent to have the same impact in adolescence. We want to make sure all children in London develop to their full potential and are prepared for the challenges of school and beyond. Giving all children in London the best start in life, with the resilience, confidence and personal skills to be able to learn is a priority for PHE. Through continued work with our partners and stakeholders, increasing awareness and engaging with parents and caregivers, we can increase the number of school ready children in London. Unfortunately you miss the point that not many children start school at five. Almost all children start school at four and some do not reach the age of five until after their reception year has finished! More parents should be made aware of their options before compulsory school age (roughly speaking, the beginning of the term after they turn 5) with respect to part time attendance, deferring to later in the school year or in fact starting school at compulsory school age rather than a whole year early instead of forcing their child to do things that are not developmentally appropriate! In fact your findings seem to support #summerborn children not starting school until compulsory school age and having a reception class entry into school once they are fine! As a paediatric nurse and understanding a great deal about child development most of what is highlighted is correct. However some children do not start reception or even reach 5 yrs old within the academic year they can start school and have been alive 25% less time than there peers.... At a young age a year is a very significant amount of time. As a summer born child my 2 yr old daughter will be due to start school next September at 4 yrs 11 days old and will not reach 5yrs old within the whole of her first school year. whilst I can aid and encourage school readiness some aspects such as fine motor skills and finger muscle strength for writing will only develop in due course so she will be at a disadvantage even if she knows how to take turns, listen and follow 2 step instructions etc. Historically there used to be 2 intakes into reception so children were 4.5 yrs before starting and the ' problems' experienced initially by some summer born children were not as evident. I welcome the recently announced review into compulsary school aged admission to reception for summer born children as holistically a child is much more likely to thrive if able to have the time to develop naturally rather than pushing a child a whole year younger than some peers to be school ready before compulsory school age. Over two thirds are not five when they start. In countries with the best academic outcomes for children they don't start school until they are six, when children are physiologically ready to undertake the tasks expected at school. Too much, too soon, bad for children, bad for schools. The push to get children to school earlier, began when falling rolls after the baby boomers bulge ended, created empty classrooms. That's hardly a problem now with rising immigration and births. Why not reverse the trend and give the children a chance. I can't believe that 2 out of every 5 children are not read for school. I really hope that the published report improves things and the relevant bodies stand up and take attention.